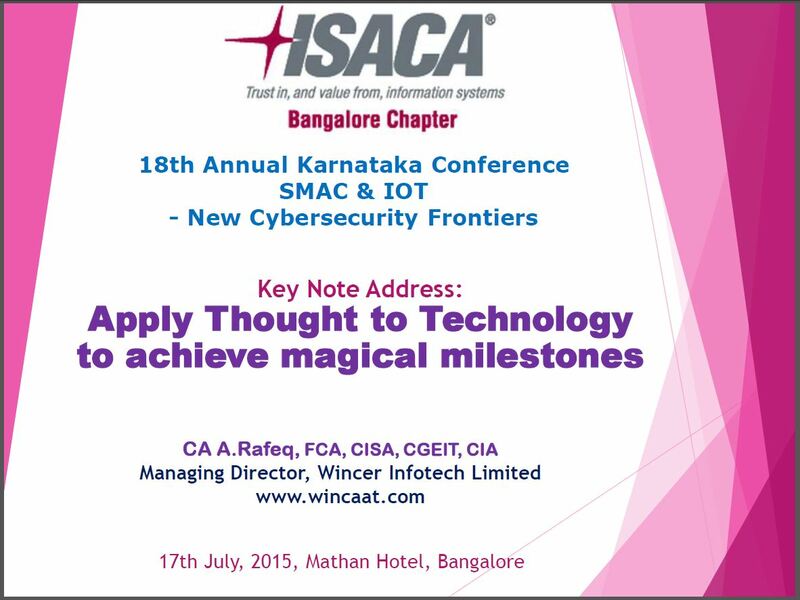 Applying Thought to Technology and achieving Magical Milestones! Before going through the above presentation, please read this brief write up which has key ideas of my presentation and the context in which I wanted to convey the message. The massive investment in digital infrastructure in India and rapid pace of Technology development and the speed of its deployment will transform how we are going to work, learn, entertain, shop, socialize, relate and live. As professionals, this poses a great challenge but we can convert this into an opportunity. To encash this opportunity, it is imperative that we update our technology skill-sets to remain relevant now and in the foreseeable future. “If you don’t update yourself, you will find yourself left on the shelf”. We need to learn to ride Technology else we will be taken for a ride! We need to learn the art of “Control” or our destiny will be “Controlled” by same technology! Technology by itself does not contribute value unless deployed in enterprises with the right application of thoughts through processes, people, systems and structures for achieving enterprise goals and business value. Technology provides results based on science of computing but it has to be driven by application of right application of thoughts translated into right type of information Systems to deliver innovative services. The Top Ten Technology Trends of 2015 were outlined and the critical importance of Social, Mobile, Analytics and Cloud (SMAC) with Internet of Things (IOT) and the increasing relevance of information security and cyber-security were highlighted. Data is getting Bigger and biGGer but the power of this BIG data can be leveraged only by application of Intelligence. The journey of enterprises is never ending but is based on specific milestones. The application of well-directed intelligence to technology in enterprises can make actualizing milestones truly magical. Technology can never replace professionals with domain knowledge, subject matter expertise and expertise. However, without technology backing, this knowledge power will become irrelevant. Our proactive acquisition of skills in emerging technology will facilitate us to enable enterprises to effectively deploy Technology for achieving goals. Our KnowLedge will help us to provide the Know-how to enterprises to be at Leading edge of technology. The skill-sets of of Inferring Insights from Information will be the key differentiator between professionals who remain relevant and those who fade into oblivion. Most of our time is spent on “Repairs and Maintenance Activities” but we need to find time to invest in “Research and development activities” also so as to be professionally relevant and contribute value. What You are is “God’s gift to you” but “What you MAKE of Yourself is Your Gift to God”. Learn to Value life and Contribute Value. Keep Learning and Keep on Moving ON. ← How to apply Thought to Data and produce miraculous results! How to apply Thought to Data and produce miraculous results!